We’d love your help. Let us know what’s wrong with this preview of Short Stories by Jesus by Amy-Jill Levine. Renowned biblical scholar at Vanderbilt Divinity School, author of The Misunderstood Jew: The Church and the Scandal of the Jewish Jesus, and general editor for The Jewish Annotated New Testament, Amy-Jill Levine reveals the "live and uncut" version of Jesus' most popular teaching tool, the parable, exposing their misinterpretations and making them come alive for today's reader. Jesus was a great storyteller, and his most effective teachings were communicated in parables. They were so effective because the parables were taken from everyday life. But everyday life in first-century Palestine was very different from today, and this has led to some unfortunate misunderstandings of the parables, involving anti-Semitism, misogyny, Christian triumphalism, or just plain bad thinking. After exposing these "problems with parables," Amy-Jill Levine takes the reader back in time to understand how the first (Jewish) hearers of the parables understood them: from their connection to first-century economy and agriculture, to their social customs and morality, to Jewish scriptures and Roman culture. With this revitalized understanding, Levine then interprets these moving stories for the contemporary reader, showing how the parables are not just about Jesus, but are also about us--and still as provocative and challenging as they were two thousand years ago. To ask other readers questions about Short Stories by Jesus, please sign up. Parables can unlock the mysteries we face by helping us ask the right questions: how to live in community; how to determine what ultimately matters; how to live the life that God wants us to live. If this isn’t Levine’s best, it’s close. She writes from a practical, scholarly Jewish perspective, highlighting the world Jesus lived in. In this book she tackles the more controversial parables Jesus spoke, making an effort to put these stories back in their first-century Jewish setting. Levine appreciates the depth of Jesus’s parables, and she digs deep in her analysis, but still seems content with an ambiguous meaning. She seldom insists on a single interpretation, yet often discards traditio If this isn’t Levine’s best, it’s close. She writes from a practical, scholarly Jewish perspective, highlighting the world Jesus lived in. In this book she tackles the more controversial parables Jesus spoke, making an effort to put these stories back in their first-century Jewish setting. Levine appreciates the depth of Jesus’s parables, and she digs deep in her analysis, but still seems content with an ambiguous meaning. She seldom insists on a single interpretation, yet often discards traditional Christian interpretations when they conflict with what she knows about first-century Palestine. In other words, she often finds the strongest meaning in the most straight-forward rendition, and that’s usually the most edgy interpretation, which fits well with what we know of Jesus-the-storyteller. The lost sheep is a repentant sinner? Naw, Luke got that wrong. The lost sheep is just a lost sheep, a financial setback like the parable of the lost coin. We should try to identify with the obsessive shepherd, not the wandering sheep. Jesus’s meaning may not be crystal clear, but if you’re not looking at the parable from a down-to-earth perspective instead of the Christian meaning that developed later, you’ll surely miss his point. This was a frustrating book to read, and a hard book to review, but this is primarily because so much of it is very good, and what (in my view) falls short is inconsistent and hard to describe. But I'm going to try because, well, that is what book reviews do. First, the really good stuff. The major argument in the book is that the Christian tradition has misunderstood the parables of Jesus Christ by turning them into attacks on the Jews, which requires that they always represent Judaism as legali This was a frustrating book to read, and a hard book to review, but this is primarily because so much of it is very good, and what (in my view) falls short is inconsistent and hard to describe. But I'm going to try because, well, that is what book reviews do. First, the really good stuff. The major argument in the book is that the Christian tradition has misunderstood the parables of Jesus Christ by turning them into attacks on the Jews, which requires that they always represent Judaism as legalistic, tradition-bound, exacting, unforgiving, and bound up in a theology of ritual and works. Levine, a Jewish New Testament scholar at Vanderbilt, calls BS. I think that she is exactly right, and I didn't realize this until I read Short Stories by Jesus. She patiently shows how the traditional interpretations of the parables all focus on reversing an ideology supposedly held by the Second Temple Jews of Christ's time. The story of the Good Samaritan shows how Priests and Levites were afraid of ritual contamination and so passed by the man who had been attacked by robbers; the Prodigal Son contrasts the works-righteousness of the Older Son with the unmerited grace that the Father shows to the Prodigal. And so on. The parables demonstrate how Jews had their chance with the Gospel, but they blew it, so God is now going to give it to the Gentiles (which, Levine points out, is the traditional interpretation of the parable of the Laborers on the Vineyard). Levine also shows that this is bunk. The Jews of Christ's time had a rich and developed theology of caring for the poor, of atonement and reconciliation, of the unconditional love of God, and most of the other things that Christians find in the parables and pretend to represent Jesus's massive departure from the Pharisees of his day. Pharisees, it turns out, were not all evil hypocrites who followed the law blindly. Lots of them were pretty cool. But they ended up with a bad wrap. Levine is clear about the difficulty that she faces in trying to resituate the parables in their original Jewish context. This is difficult work because the anti-Semitic interpretations started in the Gospels. Luke, especially, often frames the parables in ways that make the negative portrayals of Jews inevitable. So Levine has to try to parse out the core of the parable and discount the narrative setting in which it occurs, which is an extraordinary difficult sort of textual criticism to do, but I think that she does a creditable job. Basically, I think that Short Stories by Jesus does an exceptional and near-perfect job of showing that the parables don't really mean most of the things that I have always believed that they meant. But. . . . .
Overthrowing old interpretations is only part of the game. The exegete still has to show what they do mean. And here I was not as impressed. Levine does not seem to have any kind of consistent approach to positive interpretation. Sometimes she situates them in the context of the average Jewish day laborer of the time--and tries to explain what such a person would have heard. Other times, she invokes an extremely complicated critical apparatus and makes arguments that rely on commentaries and linguistic distinctions that would have bewildered the people of this context or any other. And sometimes, she offers a sort of bland "why can't we all just get along" reading that hovers at the top of the surface and never gets deeper. In the end, most of her interpretations destabilize so many traditional meanings, and offer so few compelling alternatives, that the parables end up looking like zen koans--contradictory stories that may or may not mean anything at all but which sustain an enormous amount of contemplation. This is a fine thing to be, but I don't really think that this captures the essence of how the New Testament uses parables as a teaching tool. It's not just that I disagree with the way she interprets the texts (I do, but we are supposed to disagree about such things). I don't entirely buy the implicit assumptions about why Jesus would have told these stories to begin with. Appropriately enough, Amy-Jill Levine's look at 11 of Jesus' parables – which she argues were intended to be provocative and challenging – is itself provocative and challenging. With only a couple of exceptions, she dismantles what might be considered the mainstream or popular interpretation of each parable, as well as showing how liberals and conservatives alike have domesticated the parables to better fit inside their respective ideological comfort zones. The book is most useful in correcting t Appropriately enough, Amy-Jill Levine's look at 11 of Jesus' parables – which she argues were intended to be provocative and challenging – is itself provocative and challenging. With only a couple of exceptions, she dismantles what might be considered the mainstream or popular interpretation of each parable, as well as showing how liberals and conservatives alike have domesticated the parables to better fit inside their respective ideological comfort zones. The book is most useful in correcting two millennia of anti-Jewish errors and stereotypes; Levine shows time and again how Pharisees, purity laws, the Temple and Torah were misconstrued, if not outright abused, in establishing Judaism as a foil for Jesus' teachings, when in fact the parables largely reinforced, rather than subverted, prevalent Jewish notions of the first century. This is the sort of book I love, and for a while I was planning to give it 5 stars. Then it dropped to 3 stars. I love the idea of the book b/c of the background it offers to the parables. The author is a Jewish scholar, and reads the parables in light of Jesus' Jewish background and context. She uses the Hebrew Testament and lots of Jewish literature from the time to suggest what resonances words and story lines would have for Jesus and his listeners. And she emphasizes that much Christian inte This is the sort of book I love, and for a while I was planning to give it 5 stars. Then it dropped to 3 stars. I love the idea of the book b/c of the background it offers to the parables. The author is a Jewish scholar, and reads the parables in light of Jesus' Jewish background and context. She uses the Hebrew Testament and lots of Jewish literature from the time to suggest what resonances words and story lines would have for Jesus and his listeners. And she emphasizes that much Christian interpretation of the parables has been a form of Judaism-bashing, and she reminds us that the gospel writers have often presented the parables in ways that use them for distinctly Christian purposes, and that Jesus and his listeners would not have understood or resonated with that. So far so good. There was a lot of interesting material. But there was a lot of repetition. I think individual chapters were often originally written or presented to be self-contained, so things get said over and over. This should have been caught at least by an editor, and fixed. I also realized that a lot of what the book provided was simply negative--shooting down interpretations as anti-Jewish or overly Christian. But there really was no positive take as to what Jesus was up to. After ruling out allegories and numerous over-simplifications, we come back to the stories. They are provocative, but they didn't end up amounting to something interesting. So now I was down to 3 stars. Basically, the book is a good resource--as long as you know what to expect. Amy-Jill Levine's books are usually argued very cleanly, straight forward. This reasoning in this, however, is opaque and forced. Still provides some good insights and the characteristic humor (that wears pretty thin). As a Jewish New Testament scholar, Levine sees the parables from a unique point of view. Well done. A terrific and important contribution to understanding and appreciating Jesus' parables. Strongly recommended for those interested in scriptural studies, both for the methodology employed and to benefit from Amy-Jill Levine's insights and contextualization. This book belongs in the hands not only of religious leaders for teaching, but in the hands of those who wrestle and take seriously Jesus' teachings. The parables are radical, provocative and challenging when read and heard with Jewish eyes and ears. Levine gives new insights into how the first century audiences would have heard the parables. Great book. Very insightful. Heady discourse punctuated with blips of humor. All-in-all Levine presents a compelling argument for a fresh interpretation of the parables. Her readings of them seems to amplify the subsersive tone of Jesus' teachings. This is a brilliant book, challenging because of its combination of erudition and ordinary language and appeal. It combines straightforward rendering of the parables, a reconstruction of how a largely Jewish audience would hear the stories of Jesus, tracing how Bible writers and later commentators may have altered the spoken stories, and some general close reading in the context of Levine's and contemporary experience. She critically distinguishes between a parable (a challenging, ambiguous, ope This is a brilliant book, challenging because of its combination of erudition and ordinary language and appeal. It combines straightforward rendering of the parables, a reconstruction of how a largely Jewish audience would hear the stories of Jesus, tracing how Bible writers and later commentators may have altered the spoken stories, and some general close reading in the context of Levine's and contemporary experience. She critically distinguishes between a parable (a challenging, ambiguous, open-ended story over which listeners need to struggle and reflect) and an allegory (a metaphor for something specific, a simple story carrying a certain reality or truth). De-constructing and correcting the anti-Jewish spin put on the parables by later commentators may seem very extensive and overdone to some readers, but there are good reasons for this focus: Levine herself was surprised and troubled by what she found in the record, these apparently inaccurate and misleading --if not worse--interpretations have reached millions, and she is in a good position to do the work of placing the New Testament in a longer Biblical and contemporaneous context. I need to read more of her work, because some of these refutations leave me wondering how she does see the moral discontinuity between early Christianity and the Judaism of the period. This is a brilliant book, challenging because of its combination of erudition and ordinary language and appeal. It combines straightforward rendering of the parables, reconstructing how a largely Jewish audience would hear the stories of Jesus, tracing how Bible writers and later commentators may have altered the spoken stories, and some general close reading in the context of Levine's and contemporary experience. She critically distinguishes between a parable (a challenging, ambiguous, open-end This is a brilliant book, challenging because of its combination of erudition and ordinary language and appeal. It combines straightforward rendering of the parables, reconstructing how a largely Jewish audience would hear the stories of Jesus, tracing how Bible writers and later commentators may have altered the spoken stories, and some general close reading in the context of Levine's and contemporary experience. She critically distinguishes between a parable (a challenging, ambiguous, open-ended story over which listeners need to struggle and reflect) and an allegory (a metaphor for something specific, a simple story carrying a certain reality or truth). De-constructing and correcting the anti-Jewish spin put on the parables by later commentators may seem very extensive and overdone to some readers, but there are good reasons for this focus: Levine herself was surprised and troubled by what she found in the record, these apparently inaccurate and misleading --if not worse--interpretations have reached millions, and she is in a good position to do the work of placing the New Testament in a longer Biblical and contemporaneous context. I need to read more of her work, because some of these refutations leave me wondering how she does see the discontinuity between early Christianity and the Judaism of the period. With quick wit and a penchant for pun, Amy-Jill Levine offers us a fun, challenging, and in-depth study of nine parables found in the New Testament gospels. Okay, maybe not everyone would think it fun, but I found her writing style interactive and easy to follow. I underlined and/or made notes on almost every page. The one drawback to this book is Levine's chip on her shoulder (for lack of a better term). She repeatedly argues that Christian interpreters intentionally pursue a "negative caricature of Jewish culture" (102). I have a master's degree in theology, and many of her cited sources espouse views far more extreme than any I was taught in an evangelical seminary or have read on my own. Many New Testament scholars are more generous toward 1st-century Jewish culture than those presented. I would have appreciated a more balanced representation. At the same time, Levine has a better grasp of Jewish understanding than many scholars. She reveals several plot assumptions (sometimes actual mistakes) and even grammar mistakes that church-goers have heard for years and never questioned. In so doing, she clears the fog from our eyes and brings the perspective (as much as we can in the 21st century) of Jesus' Jewish contemporaries. This is the first step in good hermeneutics. And the first surprise is this: Instead of reprinting the parables from the gospels of Matthew, Mark or Luke (there are no parables in the Gospel of John), Levine offers what she describes as a "fairly literal translation." The advantage of this is that we readers can hear the parables in a totally new way, which serves to open our ears, eyes and hearts to new thoughts and interpretations. In addition to presenting the literary and historical context of each parable, as well as what the parables might have meant to those first-century Jews hearing this itinerant preacher named Jesus, she discusses some of the more common Christian interpretations, many of which are disturbingly anti-Semitic. And finally…what do the parables mean to us today 2,000 years later? Levine brings a most unusual point of view to her writing. Not only is she an Orthodox Jew, but also a New Testament scholar, and it is this rare combination that allows her to bring a distinctive understanding to what Jesus, who was, after all, a practicing first-century Jew, meant when he told the parables to his Jewish audience. She calls the parables "pearls of Jewish wisdom." I found this interpretative approach utterly enthralling and incredibly helpful. Levine suggests that we listen to the parables the way Jesus' audience might have, from a Jewish perspective devoid of allegory. It's not an easy thing to do, since we have almost two thousand years of accreted interpretations to clear away before we can do this. Most of us come to the parables as allegories, since this is the way they are taught in church. It is also arguable that the gospel writers meant the parables to be read allegorically, but Levine tries to remove this interpretive filter Levine suggests that we listen to the parables the way Jesus' audience might have, from a Jewish perspective devoid of allegory. It's not an easy thing to do, since we have almost two thousand years of accreted interpretations to clear away before we can do this. Most of us come to the parables as allegories, since this is the way they are taught in church. It is also arguable that the gospel writers meant the parables to be read allegorically, but Levine tries to remove this interpretive filter and present them as the original words of Jesus. To understand the parables in this way requires historical context, and Levine presents plenty of it. As a result, we learn quite a lot about the Jewish Jesus, and to a lesser extent the anti-Semitic slant that later allegorical readings cast. So what is left when allegory is removed and historical context rights the ship? Ambiguity, for one thing, and discomfort. There is an old saying that the parables are supposed to comfort the afflicted and afflict the comfortable. The first comfort to go is a complacent exegesis. Levine offers her own reading of the parables, a reading invested in Jewish scripture, but her conclusions come in suspiciously simple packages neatly tied at the end of her analysis. They are simple, but not simplistic, and yet I have difficulty with them. Levine would argue that that means the parables are doing what Jesus intended them to do, but I'm not so sure. In any case, I'm convinced that this is a fine analysis, and one worth returning to. I learned about this book while listening to an interview of Amy-Jill Levine by Peter Enns on a podcast series called "The Bible for Normal People". Thank you, Dr. Enns! This book does what all good books should do. Instead of reinforcing old ways of thinking about a topic, it challenges readers to reexamine their assumptions. When Amy-Jill Levine questions the conclusions of several of my favorite writers (Craig Blomberg and Kenneth Bailey, for example) I am reminded that human authors are falli I learned about this book while listening to an interview of Amy-Jill Levine by Peter Enns on a podcast series called "The Bible for Normal People". Thank you, Dr. Enns! This book does what all good books should do. Instead of reinforcing old ways of thinking about a topic, it challenges readers to reexamine their assumptions. When Amy-Jill Levine questions the conclusions of several of my favorite writers (Craig Blomberg and Kenneth Bailey, for example) I am reminded that human authors are fallible and I need to be constantly evaluating their arguments, no matter how convincing they may seem. What I want to remember from this book is that the purpose of parables is to challenge and surprise the listener. If a parable is simply telling people what they already think they know, then it has fallen short of its mission. We must test our interpretations accordingly. Levine deals thoroughly with a number of parables. She counters a lot of common interpretations, using plenty of primary texts to discredit assumptions. One of the main issues she takes up is how Christian scholars tend to add unfounded biases against Jews, thereby mischaracterizing the intent of the parables. She has a strong argument here. The main goal is to show what the parable would have meant to the original audience. Another thing she does well is to remind us that these parables were me Levine deals thoroughly with a number of parables. She counters a lot of common interpretations, using plenty of primary texts to discredit assumptions. One of the main issues she takes up is how Christian scholars tend to add unfounded biases against Jews, thereby mischaracterizing the intent of the parables. She has a strong argument here. The main goal is to show what the parable would have meant to the original audience. Another thing she does well is to remind us that these parables were meant to be personally challenging. If we think to ourselves 'I really like that parable,' we probably missed the point. Levine argues that (in part due to bad interpretation, in part to sheer familiarity) Jesus’s parables are not surprising to us, and therefore we don’t understand them. So for each of the parables she tackles, she spends most of the time digging into the historical and biblical context, unearthing the things we don’t see — and every time I thought “oh now I get it” she would jump in with “nope, that’s not it!” So I’d say she’s successful in rendering these “domesticated” stories unfamiliar. Much Levine argues that (in part due to bad interpretation, in part to sheer familiarity) Jesus’s parables are not surprising to us, and therefore we don’t understand them. So for each of the parables she tackles, she spends most of the time digging into the historical and biblical context, unearthing the things we don’t see — and every time I thought “oh now I get it” she would jump in with “nope, that’s not it!” So I’d say she’s successful in rendering these “domesticated” stories unfamiliar. Much of the book is devoted to revealing Jesus’s Jewishness (and corresponding economic concern), and although the overarching argument that Jesus was not anti-Jewish/anti-purity/anti-Law/etc was a bit heavy-handed at times, she made her point, and it is an important one, and as she said, these interpretations are so pervasive they are very easy to slip into. Levine talks about many ways the parables are misconstrued - often focusing on anti-Semitic interpretations, but also looking at how we avoid the obvious or try to explain it away. I like how she, correctly, debunks many of the beliefs about what some people think ancient Jews were like. The book tries to wake people from saccharine piety to real world concerns. I suppose this book addresses real problems, but how many educated people agree with the old formulations today - except for those with specific agendas? Remember, extreme fundamentalists are a minority (although you might not think so from the media). So are those who want to reformulate the ideas for other causes. Fascinating book. A professor of New Testament an expert on 1st century Palestine, and practicing Jew, Levine gives a view of how the parables would have been heard by their 1st century Jewish audience. Modern Christians tend to hear the parables as allegory instead, using theology that was not available to the original audience. This allegorical hearing takes away a great deal of the direct challenge and the call to social justice that the original audience would have heard. Levine state that i Fascinating book. A professor of New Testament an expert on 1st century Palestine, and practicing Jew, Levine gives a view of how the parables would have been heard by their 1st century Jewish audience. Modern Christians tend to hear the parables as allegory instead, using theology that was not available to the original audience. This allegorical hearing takes away a great deal of the direct challenge and the call to social justice that the original audience would have heard. 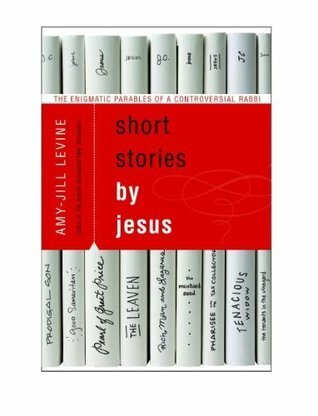 Short stories by Jesus: the Enigmatic Parables of a Controversial Rabbi by Amy-Jill Levine is a meaningful look at eleven on Jesus’ parables by a Jewish biblical scholar. Thorough and readable, Levine reveals what Jesus’ first-century audience likely thought when first hearing these challenging stories. The Good: Excellent examination of the text. Levine’s seemingly-easy questioning of the text hides her hermeneutical skill. The Bad: Repeated dismantling of anti-Semitic interpretations of Jesus’ p Short stories by Jesus: the Enigmatic Parables of a Controversial Rabbi by Amy-Jill Levine is a meaningful look at eleven on Jesus’ parables by a Jewish biblical scholar. Thorough and readable, Levine reveals what Jesus’ first-century audience likely thought when first hearing these challenging stories. The Bad: Repeated dismantling of anti-Semitic interpretations of Jesus’ parables. It is sad that this is necessary. The Ugly: Levine is an academic biblical scholar, which means conservative Christian readers might find her unpalatable. That is a crime, and they are poorer for dismissing her. Levine's explanations of Jewish thinking regarding the parables she concentrates on are highly informative. First, she appropriately convicts us Christian pastors for the highly anit-Jewish readings of these parables and (I know from experience) that we hand this misinformation down to each other. Second, I really liked her careful translation from the Greek bringing up some interesting new looks at the meaning. I will be reading more of her books. My only c Excellent and highly thought-provoking. My only complaint is that, as an academic, she took too much time responding to this or that academic and sometimes belaboring her point.